Today we continue our series on the top players at each position heading into the beginning of the season. Today we discuss the running backs. The NFL has devalued the position in recent years and last year for the first time in a long time there were no first round running backs taken in the draft. We’ll see if that trend continues. Here are our top five. 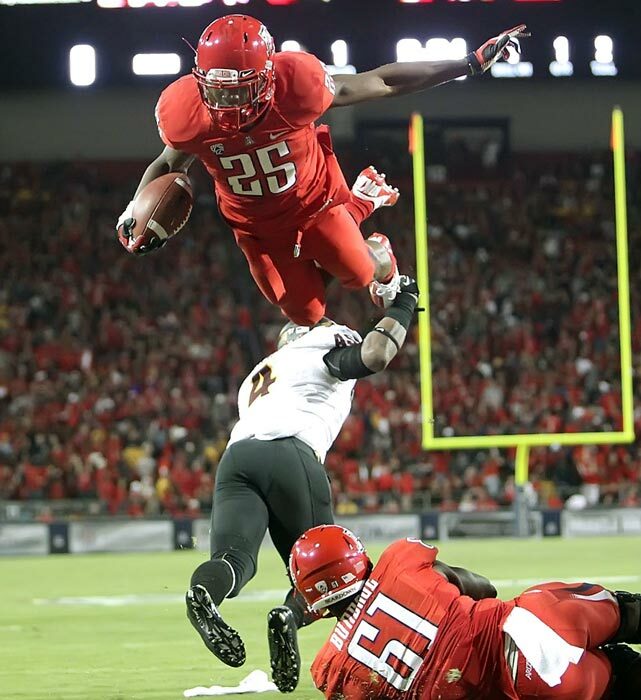 Ka’Deem Carey is a very underrated running back. He led the country in rushing with 1,929 rushing yards and 23 touchdowns. He was a first team All-American and broke the school record for rushing yards in a season. Carey has great vision and makes people miss in the open field. He has great lateral movement, and burst. Once he gets into open space, he is difficult to bring down. He uses his quickness to avoid tacklers and defenders rarely get a solid hit on him. Carey also helps out in the passing game and has soft hands.He doesn’t have great size and runs a bit upright, but if he breaks free, he is special. He also needs to work on protecting the ball and protecting the quarterback, but Carey is the best back available in this year’s draft. The one possible red flag with Carey is his character. He was charged with domestic violence involving the mother of his child. The charges were dropped, but you better believe NFL teams will be doing their due diligence investigating any possible issues. If NFL teams are comfortable with his maturity, he could very well go in the first two rounds. Any time DAT plays, you should start a timer to see how long it takes the broadcast crew to mention Snoop and his Black Mamba nickname. It happens every broadcast. Thomas is a very fast, explosive player that is a threat to go all the way every time he touches the ball. At 5’9” and 163 pounds, he won’t be a 25 carry per game back, but he’s a guy that you want to get the ball in his hands in the open field. It’s rare to find a featured running back under 190 pounds, so my guess is he might be a guy who makes a living lining up in the slot the majority of the his career. In my mind, DAT is a guy that could be used similar to the way that Tavon Austin will be used in St. Louis. Thomas has rare speed and if he ever gets by you, he’s gone. He is also a dynamic kick returner. Lache Seastrunk was a highly touted high school running back that started his career at Oregon. However, he was stuck on the bench behind LaMichael James, Kenjon Barner and De’Anthony Thomas. Seastrunk then transferred to Baylor to be closer to home. He got his chance to get on the field and last year finished with four straight games of more than 130 yards rushing. Once Seastrunk got his chance on the field, he let his early career issues motivate him and he runs with a chip on his shoulder. Lache Seastrunk has a slashing running style and a low center of gravity and balance which allows him to cut on a dime. He does a good job anticipating creases and uses his lateral agility to cut back to the proper running lane. Seastrunk has strong legs that churn after contact, making him tough to bring down. NFL offenses require a running back to be able to pass protect if they want to play on 3rd down and Seastrunk holds his own in that department. Since coming to Baylor, he has become bigger and stronger and 2013 could be a big year for him. If Seastrunk can have the type of year that many people expect, he could improve his draft stock should he decides to declare for the 2014 draft. Silas Redd was the offensive catalyst for the 2011 Penn State Nittany Lions. After the Jerry Sandusky scandal hit, the NCAA allowed the Penn State players to transfer to any NCAA school without having to sit out a year. Redd quickly jumped at the opportunity and transferred to USC. Many people thought this made the Trojans a dream team since USC already had quarterback Matt Barkley and receivers Robert Woods and Marqise Lee. Sadly, the 2012 season did not work out for Southern Cal or Redd. The team that was picked as a possible contender for the national championship lost 5 out of their last 6 and Redd battled injuries the entire season and split time with Curtis McNeal. Redd led the team in rushing, but he fell way short of the 1,241 yards he rushed for at Penn State. Silas Redd has good size at 5’9” and 209 pounds. He is a tough inside runner that does very good in short yardage situations. For a back his size, he has some shiftiness and wiggle to his running style. Now that Barkley has gone to the NFL, I look for USC to lean on the running game more this year to help out the quarterback. The Trojans are still attempting to determine who will take over for Barkley, but whoever wins the job, they will be young and inexperienced. An experienced running back can be a young quarterback’s best friend, so if Redd can stay healthy I expect him to have a big year. Damien Williams was a 2nd team All-Big 12 selection in 2012 and was one of the top newcomers to the Big 12 after transferring from Arizona Western Junior College. Williams led the Sooners with 946 rushing yards and 11 touchdowns. Williams has a good combination of size and speed. He plays with good pad level and does a good job running between the tackles. Williams is a one cut back who will take on defenders and stays on his feet after contact. He struggles at times when he tries to go parallel to the line of scrimmage and does a better job when he can stay north-south. Williams also helps out in the passing game with 34 receptions last year. If Williams can shake the nagging injuries that hampered him late last year, he can have a good year in an offense that appears to be more run oriented in 2013. This entry was posted on August 16, 2013 by draftmaniacs in Top 5 at each position and tagged 2014 NFL draft, Arizona football, Baylor football, Damien Williams, De'Anthony Thomas, Ka'Deem Carey, Lache Seastrunk, NFL Draft, Oklahoma football, Oregon football, Silas Redd, USC football.